November birthdays are celebrated with topaz and citrine. The warm yellow-orange color palate is perfectly seasonal, and we find it well-compliments yellow gold settings. Topaz has a tricky history. The range of color found in nature – from clear, to pale blues and pinks, to bright orange – meant that it was sometimes confused for other similarly colored gemstones. In fact, we now know that the gemstone mined on the Greek island of Topazius, for which Topaz is named, was actually chrysolite. Georgian yellow topaz and 14k gold link bracelet, at Gray & Davis. Citrine and topaz were also confused for each other hundreds of years ago. Now, with modern gemology tools, it’s easy for us to determine which is which in our antique pieces. 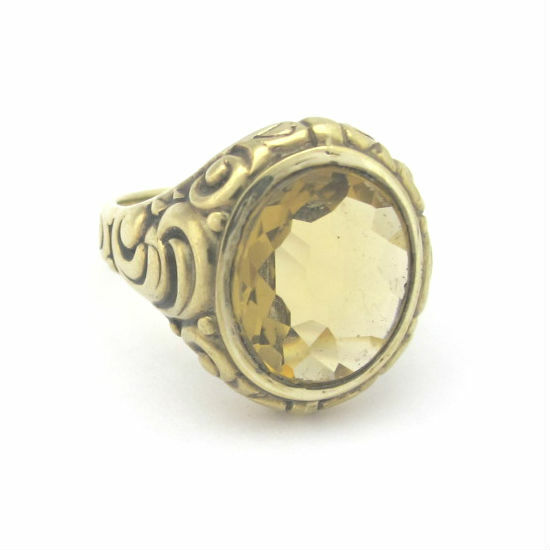 Victorian 14k gold and citrine ring with a carved intaglio, available in our online shop. Victorian 15k gold and mixed cut citrine ring, at Gray & Davis. Help us warmly celebrate our friends with November birthdays with this warm-hued gemstone!